Garden of Aaron: The Heat is On! Which plants can survive a hot, dry Tennessee summer? The Heat is On! Which plants can survive a hot, dry Tennessee summer? The other night, I heard that nearby Franklin, Tennessee has started requesting voluntary water conservation from its citizens. There hasn't been much news about the drought yet (despite the fact that Tennessee's rivers are at or near historic lows this year), but I can tell you that it is hot and dry. We're talking mid-90s Fahrenheit (~35 Celsius) every day with high pressure parked over the region and no rain in sight. But I don't care much about lawns. 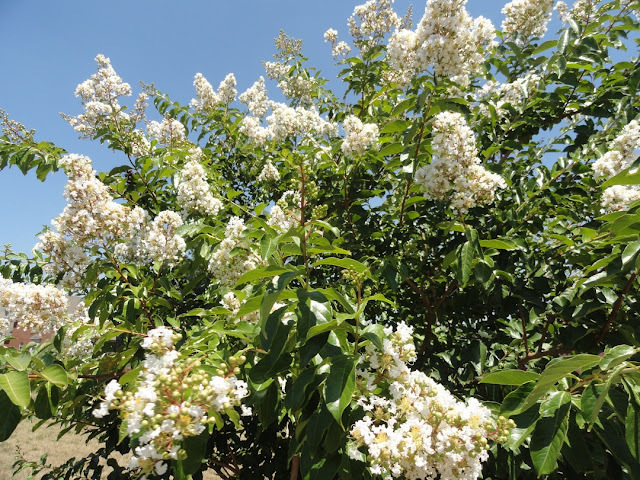 If I could afford it, if our HOA would allow it and if I thought it wouldn't adversely affect retail value, I'd rip it all out and replace it with landscaping with greater ornamental value and greater wildlife value for bees, butterflies, birds and other critters. But that raises the pertinent question of what plants can survive the extremes of a mid-Tennessee summer. And I can tell you right now that it's not looking pretty. 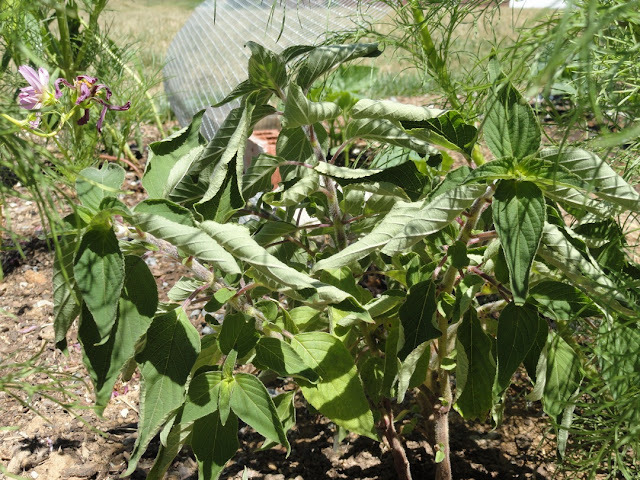 Take the Pineapple Sage (Salvia elegans) at the top of this post. I thought this was supposed to be heat and drought tolerant, full sun plant. Apparently, I was misinformed. On closer research today, I discovered from Floridata that pineapple sage needs regular watering for best growth and flowering. Apparently it can sometimes survive a drought by wilting and dropping its leaves, but it won't thrive in drought conditions. 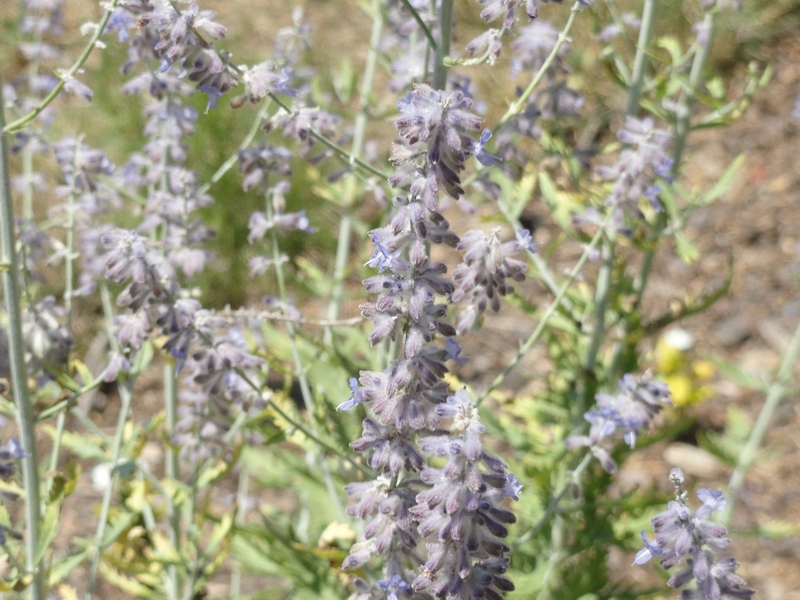 How about Russian Sage? As you can see below, the plants are still rocking away and producing a profusion of blooms that attract a happy chorus of buzzing bees all day long. Well, let's not make this post all doom and gloom! The good news is that after weeks of teasing with nothing but foliage, the French Marigolds (Tagetes patula) have started to burst into bloom. True, the 'Sparky Mix' seeds I bought from EverWilde were supposed to grow into plants 12-inches tall, whereas the actual plants are less than half that height, but the flowers are endearingly luminous. Some of the leaves Natchez crape myrtles are looking a little limp, but the trees themselves are covered in blooms. I think we have many more flowers this year than last year. 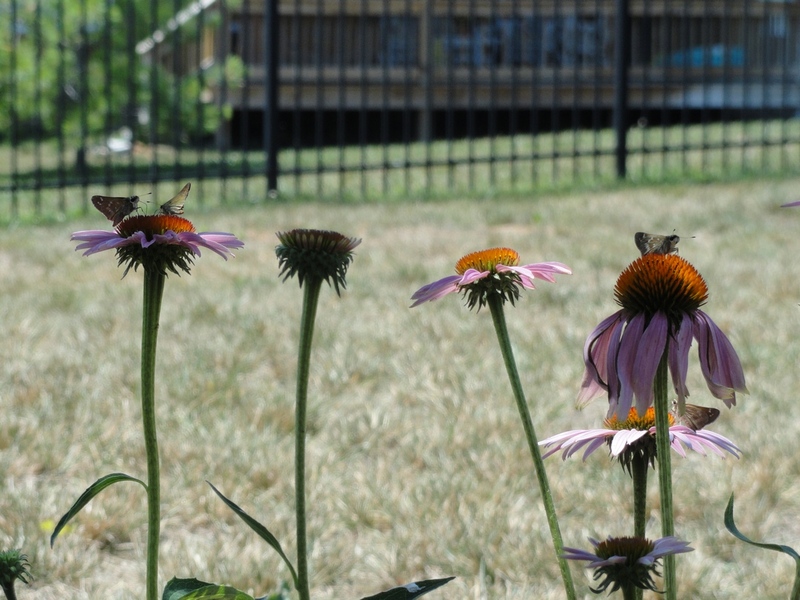 And Purple Cone Flower (Echinacea purpurea) is still going strong, to the delight of bees and butterflies. (At least, I think these are butterflies, operating on the layman's assumption that moths land with wings flat and butterflies fold their wings...) University of Maryland's Cooperative Extension describes purple cone flower as "quite drought tolerant," while University of Delaware's Extension service describes Echinacea purpurea as being "very drought resistant." Interestingly, definitions of drought tolerance may differ here in the U.S. versus across the pond in Europe. I found one U.K. site that says Echinacea needs water at least weekly in full sun. I'm guessing that is the case, as a couple of my Echinacea are looking a little drought-stressed (though they're still getting by much better than the pineapple sage or the zinnia). Perhaps in very hot areas with drought risk it makes sense to ignore the usual full sun recommendation and plant Echinacea where it will get some afternoon shade? 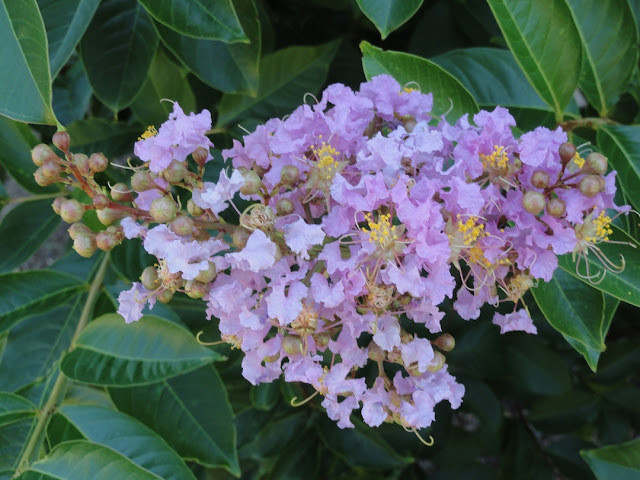 We have four or five of the Natchez crape myrtles in full sun, as well as an unidentified lavender crape myrtle that gets less morning sun, though it does get plenty of solar radiation in the afternoon. This specimen is thriving, growing vigorously and not exhibiting any signs of drought stress. Of course, it also has hardly any flowers at this point, but the one bunch of lavender flowers that has opened looks lovely and has a light, sweet fragrance. Over to the front of the house (morning sun, afternoon shade), we find that Calycanthus floridus, also known as Carolina allspice or sweetshrub. Floridata says that Calycanthus likes moist soils, but can survive drought. I've been giving the plant a deep watering twice a week and so far it seems to be limping along with just a bit of leaf tip browning. The plant is native to the Southeastern U.S. and is supposed to have fragrant spring flowers. Obviously no flowers this year as this tiny plant (purchased through mail order) is just getting established, but I'm hoping I can nurture it through the drought so that I can enjoy its flowers next spring. Last but not least, here's a look at an Ajuga reptans that seems to have happily established itself in one of the shadier corners at the front of house. North Carolina State University (NCSU) includes ajuga on its list of drought tolerant plants, and this specimen certainly seems to be living up to its reputation, perhaps helped by the fact that it gets shade from about 10 a.m. onwards. 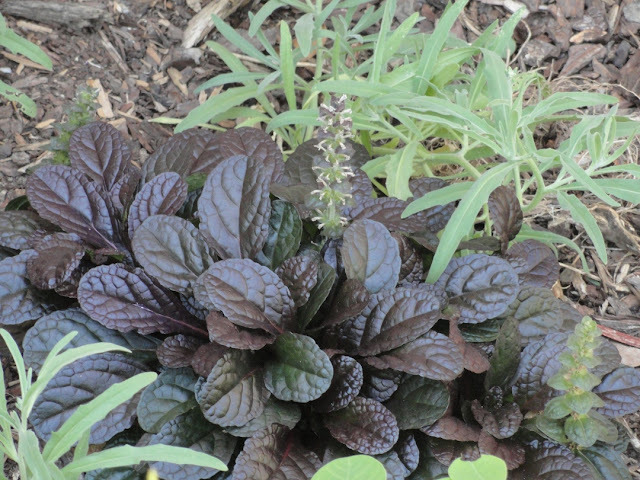 It's not a particularly flashy plant, but I've definitely come to appreciate ajuga's shiny, classy foliage. I'm hoping it spreads into a sizeable groundcover, and I suspect that next year I'll be able to enjoy more of its blue flower spikes. That's all for now. I didn't include any photos (to keep this post at a somewhat manageable size) but I can tell you that the Autumn Joy sedum and the phlox paniculata (shown in the June 21) post are both doing fine. Both sedum and the phlox are on the NCSU list of drought-tolerant plants. The drought has struck harder and earlier than usual in Tennessee, but we're certainly no stranger to droughts here and this experience has only reinforced my feelings on the importance of planting drought-tolerant or drought-resistant plants in any climate that is prone to water shortages. It seems to me this makes sense for two reasons: (1) You may enjoy watering (I do), but it's nice to know that your plants can survive for an extended period of time if circumstances prevent you from watering for one reason or another, and (2) with 300+ million people in the U.S. and 7+ billion people around the world, planting a landscape that needs lots and lots of supplemental water doesn't seem like such a swell idea. 1. 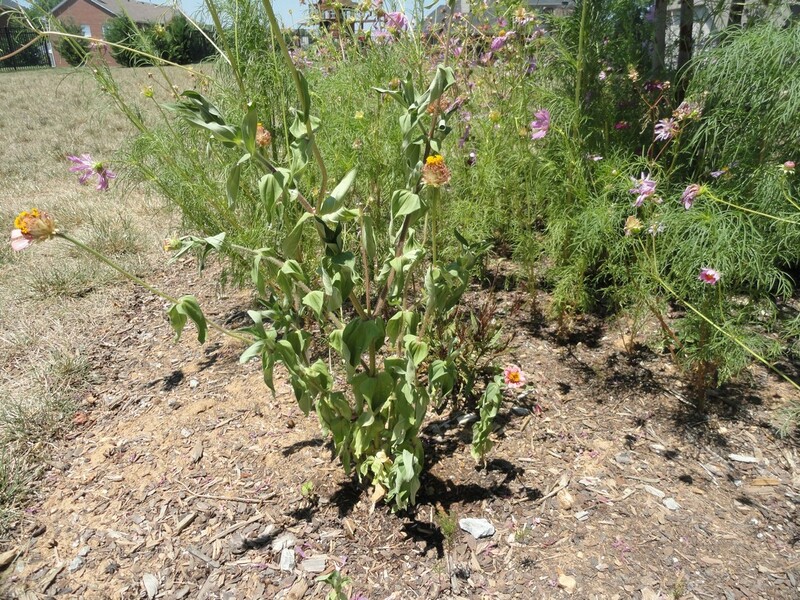 Is your garden facing drought now or have you faced drought recently? 2. If you've encountered drought in your garden (now or in the past), what have turned out to be the toughest and most drought-tolerant plants in your experience? 3. How do you define drought-tolerant? 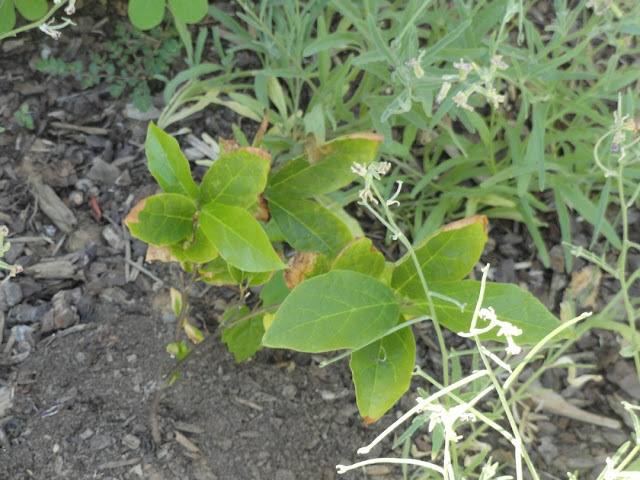 Is a drought-tolerant plant in your garden one that only needs water once a week? Once a month? Never needs any supplemental water? Thanks for reading! And let's hope for rain -- 'cause it's a good thing! PS - Curious as to what's going on in the veggie garden? Check back in a couple of days for an update on the tomatoes, cucumber, pole beans, okra and more! Drought here and even though I have switched my style of gardening no plant is going to survive with no rain in such a long time (more than one month). That being said some will go dormant and perhaps live to bloom another day. The hydrangeas are never drought tolerant and I always have to water them. The pineapple sage always needs water here too. Honestly though I can let them go dormant or die since they are annuals here and even if I have to winter them over in the greenhouse at least one will survive. Russian sage rocks in the sun. Also the sedums, verbena bonariensis, agastache, daylilies, and spiraea all seem to be fine with no moisture. Thank goodness. Oh yes, yuccas, grasses and prickly pears work well. I have tons here due to the watering issue. We can water all day but who wants the bills-not me. Summertime I about give up on the garden except veggies. I hope we do get rain next week though! So how often do you water your drought-tolerant plants (Russian sage, for instance) versus the drought-intolerant ones (a.k.a. pineapple sage) in midsummer heat? And do all plants need supplemental water -- even yucca and prickly pear -- if it doesn't rain for a month? What about your veggie garden? Do you water daily? I've been giving the tomatoes tough love (water twice weekly) but I do confess that the beans, cucumber seedlings and (stunted) okra seedlings get water pretty much every morning. I just look around at the undeveloped meadows nearby and see wildflowers blooming away so I know that not everything in nature needs water from a hose, but it sure seems like most of the perennials and annuals need help in a drought. And yes, let's hope for rain soon!! Hey Aaron, it seems us folks here in the south face at least one period of drought every year. Here in SW VA, last spring was the wettest on record and summer was the driest on record. We're in a very dry period again right now. I find that all plants need a lot of water the first year they're in the ground, and each successive year the withstand drought better and better. Three years seems like the magic time frame. Annuals always need a lot of water because their plant cells contain more water than woodier plants, that's why they die when they freeze, ice crystals rip their tissues apart. My favorite drought tolerant plants happen to be natives, they've evolved to handle our specific climate better. Purple coneflower, of course, also Wild Bergamot (monarda fistulosa), Foxglove Penstemon (penstemon digitalis), goldenrods, asters, etc. I'm also quite fond of some southwestern natives, like hummingbird mints, which I think are Agastache rupestris and Agastache cana hybrids, they're like russian sage, they can really take the heat and bloom all summer. Texas Yucca also. Check out High Country Gardens for those. We're also big fans of our rain barrels, you'd be surprised how quickly they fill up in an afternoon thunder boomer, they can really make a difference ad save your garden, especially if you're on water restrictions. They can be expensive, $800 for four 60 gallon barrels, one on each corner of the house, but eventually they pay for themselves. Best of luck in your drought, I find myself hoping for a hurricane or two to come through, seems that's the only time we ever get real rain in the summer. I'm certainly hoping that plants like the Calycanthus and Ajuga (as well as others not shown here including Sweet Woodruff, several chokeberry trees and an American Beautyberry bush) will become more drought-tolerant next year if I can nurse them through this hot and dry spell. So is "drought-tolerant annual" a contradiction in terms like "jumbo shrimp"? 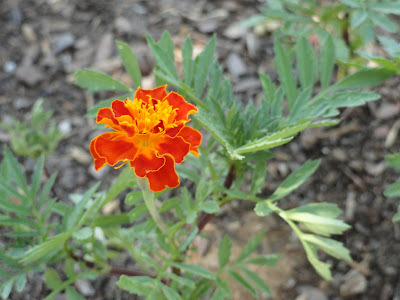 I do find that cosmos and zinnia are fairly drought-tolerant, but I guess it's all relative. Thanks for your suggestions! I tried direct sowing Monarda 'Bergamo' from seed with awful results (nothing came up), so my plan is to buy some monarda plants next year from a nursery. Penstemon and Agastache are on my wish list too (though I'm slightly worried about whether my clay soil will accommodate what I've read about the Agastache's need for good drainage...) And thanks for the rec on Yucca, which I've also started to consider after seeing some thriving in parking lots around the area. Are there any particular rain barrel manufacturers with a good reputation that you'd recommend? In Kansas last year, we were very dry but nothing like OK or TX. Sorry to see your zinnia carcass. Never seen one so sad in 40 years of gardening. I'm a big fan of High Country Gardens. I think they're the leaders in the high heat/ Low Water gig. The plants are small but soon fend for themselves. Coming from Kansas, we love our cone flowers and the new coors are da bomb but some are just a bomb. Glad to find your blog via Dee's one. Have to admit that I'm a bit embarrassed to hear that my zinnia wins top-prize for the most dessicated specimen you've seen in 40 years. But I guess intense drought and all-time record heat (109 today at Nashville airport!) will do that. Having tried several mail order nurseries that were highly rated on the Daves Garden site, I've decided that I generally prefer to buy at local nurseries. If you can find a good local purveyor, I think one can often get much healthier and more mature plants for a lot less money than the mail order companies. That said, I do like the selection from some of the online companies and have had best luck so far in both quality and customer service from Bluestone Perennials. Thanks again for your comment. Hope you will become a regular reader and commenter! Aaron, without a doubt the best rain barrels I've seen are made by Rain Water Solutions out of Raleigh, NC, we have 5 Mobys. They're extremely sturdy and designed with all the right features. Casa, you're (relatively) lucky! We've had 1/2" of rain in the last *month*! Thank you very much for all the suggestions. I'll look into planting all of them in future years to see how they fare in TN. Thanks for the suggestions on Prairie Moon and High Country Gardens. As I wrote to Patrick above, I wasn't too happy with my High Country experience, but I may give Prairie Moon a try in the future! 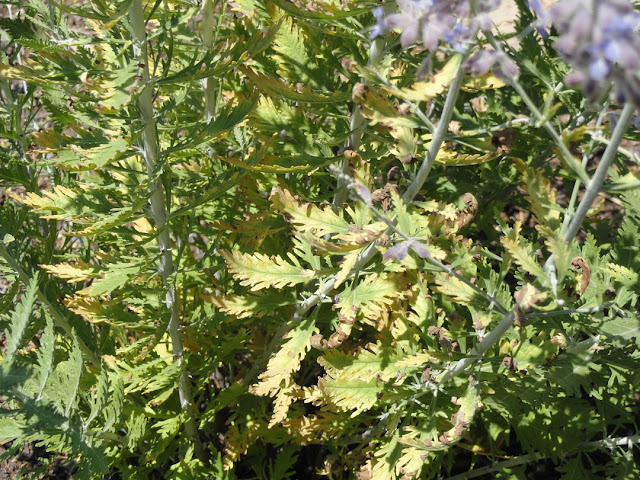 ive got the same yellow leaf problem with russian sage and have also read too much or too little water, most seem to say too much water. i also read the bottom leaves yellow if growing fast and not enough nitrogen, a bit like tomato plants. My Russian Sage is looking *much* better this year. Two of the three plants don't seem to have any yellow leaves at all, the other has just a few. We had a very wet spring and a sort of normal precipitation start to the summer. So despite Russian Sage's reputation for drought tolerance, while they may *survive* a drought, I think they need water to look their best. At least that's the way it seems here.